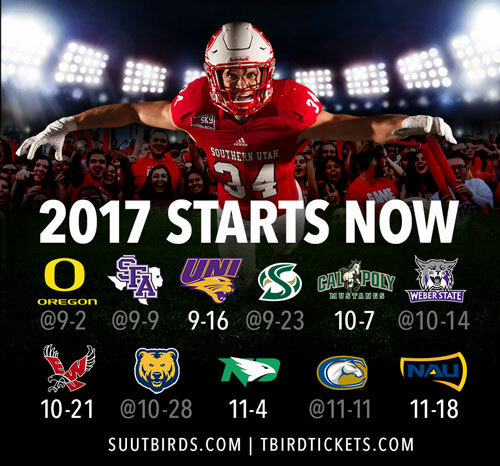 The Southern Utah University football program has announced its 2017 schedule, highlighted by preseason games against Oregon, Stephen F. Austin, and Northern Iowa. The Thunderbirds will kick off their season in Eugene, Ore. as they take on the storied University of Oregon Ducks on Sept. 2. Following the matchup with the Ducks, Southern Utah will be back on the road to face Stephen F. Austin on Sept. 9 before opening its home season in Eccles Coliseum with Northern Iowa on Sept. 16. SUU will launch into its Big Sky Conference season at Sacramento State on Sept. 23 before taking a BYE the following weekend. The Thunderbirds return to Big Sky action hosting Cal Poly on Oct. 7 for SUU’s homecoming game. “The best part of the schedule is that Cedar City will get to see some great programs come into Eccles Coliseum,” Warren said. Returning to the road, the Thunderbirds will travel to Ogden to battle with Weber State for the Beehive Bowl Trophy on Oct. 14. Southern Utah returns to Thunderbird territory to host Eastern Washington on Oct. 21 before traveling to Northern Colorado on Oct. 28. After hosting North Dakota on Nov. 4, the Thunderbirds will finish off their road schedule at UC Davis on Nov. 11 before hosting Northern Arizona in the battle for the Hinton-Burdick Grand Canyon Trophy on Nov. 18. Hosting Northern Iowa, Cal Poly, Eastern Washington, North Dakota, and Northern Arizona will present a big challenge for the Thunderbirds as they look to continue their 9-1 home record over the last two seasons, but they are ready for the task. Tickets are available now at tbirdtickets.com with season tickets starting at just $45 for bleacher seats and $75 for chair-backs. Family passes are also available, which include five tickets to each game for just $125. Single game tickets are available for just $10 bleacher seats and $20 for chair-backs. Single game family packs include six bleacher seats for $30. For all Thunderbird football news and updates, follow @SUUFB on Twitter and Instagram along with liking SUU Football on Facebook.